Venice is an amazing place. At least when it's not raining. I remember arriving in Venice when it was raining. The buildings were dull, drab, and dirty looking. I wondered what people thought was so beautiful. Then the sun came out. The wet dried up and the buildings took on a whole new look. New brighter colors. A cleaner look. And then the the golden accents in the roofs and turrets and the mosaics began to gleam. It truly was beautiful. But what was all that commotion in the square? Pigeons. Lots and lots of pigeons. Vendors were out and about selling bags of corn to feed them. It was a tourist tradition. Feed the pigeons. See how many you can get to land on you. Some people were seen lying on the cobblestones, covering themselves with bits of corn only to be covered head to toe with pigeons. Alas, that tradition is no more. 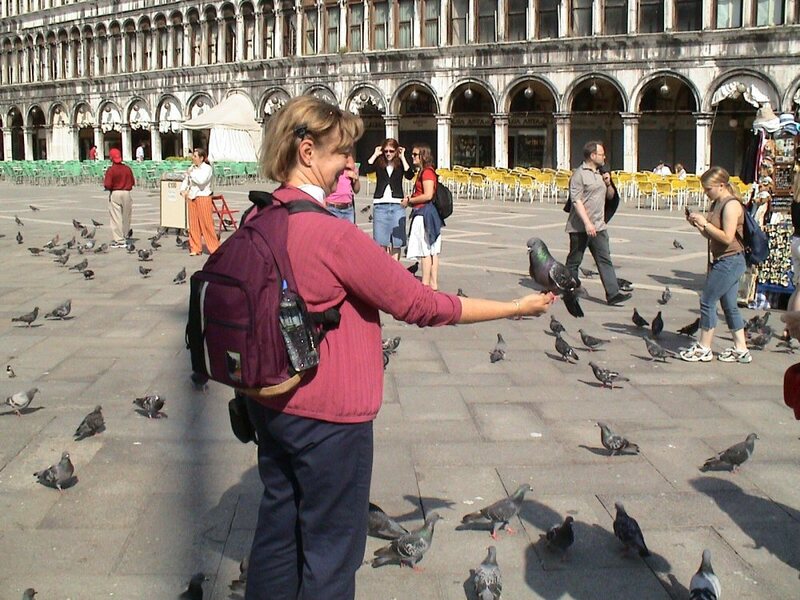 I discovered that the vendors were banned from selling corn back in 2008 and it is now forbidden to feed the pigeons in St. Mark's Square. It is for the best I think. 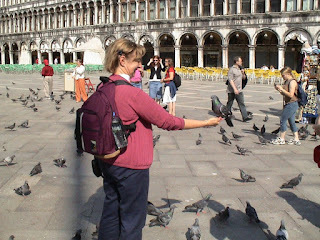 The pigeons weren't doing the facades of the ancient buildings any favors. I'll bet they still have $15/cup cappuccino though.